What is it about Dr. Seuss books that makes kids want to hear them again and again and again? I pretty much had The Cat in the Hat memorized around Maggie’s third birthday, so a Seuss-themed party was a natural choice! For this party I decided to go with a pull-apart cupcake cake. I was worried that the frosting would sag between the cupcakes, but it turned out great! Another hint: it really helped to put a dab of frosting under each cupcake so they didn’t slide around while I was decorating the top. The food was fun! 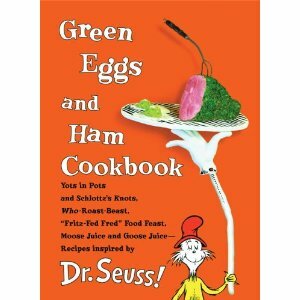 I used a copy of this Green Eggs and Ham Cookbook for most of the ideas. Maggie loves strawberry smoothies, so I made an entire pitcher full and called them the “Pink Yink Ink Drink.” Of course there was a green ham (thanks to a healthy patting of chopped parsley and cilantro) and roast beast, along with green eggs (deviled eggs with yolks dyed green). Pasta was a must (our children would eat pasta for every meal if we let them) which we named “Noodle Eating Poodle Noodles.” For dessert we had the cupcakes with Who-Pudding instead of ice cream. For activities, the kids played “Pin the Tail on the Cat” and a version of duck-duck-goose called “Cat, Cat, HAT!” We also read some Dr. Seuss stories, colored, and hunted for green eggs. 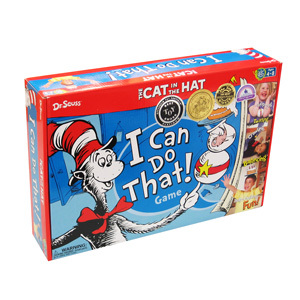 A friend gave us a Cat in the Hat game, so the kids had a lot of fun trying to do the silly tricks it required. The party favors were colorful mini Easter baskets filled with Dr. Seuss stickers, erasers, and pencils. Is there a recipe for this I need it for my foods class? Which food item did you need a recipe for?